I sided with the Dawnguard first. Yes, the vampire hunters. The ones who can’t transform into floating, life-stealing necrotanks. The ones who get a fairly staid crossbow instead. I wanted to be boring. As the first batch of DLC for the wildly successful latest Elder Scrolls entry—and a DLC that’s faced some controversy after its respective PC and PS3 releases weren’t officially announced until the Xbox 360’s 30-day exclusivity period ended—Skyrim: Dawnguard has a lot to live (unlive?) up to. Though now out on PC (PS3 owners are, as of writing, still in the dark), the question remains: What can you really add to a game as unrepentantly huge in scope as Skyrim? Our plot concerns the titular Dawnguard—an ancient, recently reformed order of vamp-killers operating out of an eponymous fort in eastern Skyrim—and their rivals, the Volkihar vampires—an equally ancient clan of hematophages based in an equally eponymous castle in western Skyrim. The Volkihar’s blood-kinship to their lord, Harkon, grants them powers beyond those of a normal vampire. Yeah, “super-vampires” works. The main quest—and stop me if you’ve heard this one before—involves an also-ancient prophecy (the blotting out of the sun), the reading of an Elder Scroll (three, actually), the exploration of undiscovered ruins (Snow Elf cities gentrified by their feral descendents, the Falmer), and epic, carefully orchestrated, yet bloodless (ugh) set-piece battles you’ll want to rush through as fast as possible. And, of course, the player may choose to either prevent the prophecy by supporting the Dawnguard, or see that the “tyranny of the sun” comes to an end as an undead one-percenter. It’s this choice that, more than anything else, will define your time with Dawnguard. In a larger sense, it’s a choice between good and evil, reserve and excess, sacrifice and power. More pressingly, it’s a choice between whether you want a tricked-out crossbow or the power to morph into a bulky bat-person. The crossbow, the Dawnguard weapon of choice, is theoretically a side-grade alternative to the bow, offering more damage and a quicker first shot in exchange for a lower rate of fire. In practice, it feels overpowered, dishing out absurd damage even without the numerous upgrades, enchantments and special bolts that increase its monster-killing capabilities. 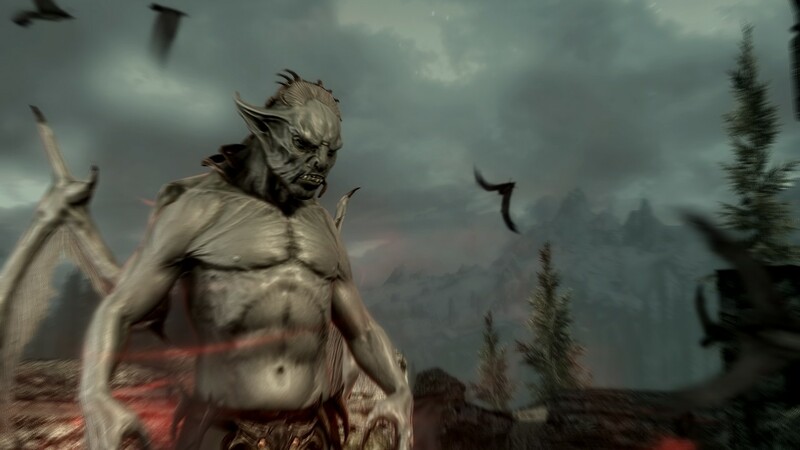 Siding with the vampires doesn’t prevent the player from getting one (you can pick the basic model up for free early on, or “borrow” one from an opposing Dawnguard soldier), but even its power pales in comparison to the “gift” given to Volkihar supporters: the Vampire Lord transformation. Akin to lycanthropy and its werewolf form, the Vampire Lord is an alternative “race” of sorts, which the player can transition into at their whim. While transformed, players can draw from an ample pool of blood magic to summon gargoyles, paralyze foes, drain life from a distance, slow time, become mist and, most enjoyably, employ Force-style telekinesis to choke and hurl enemies—all in addition to basic slashes and neck bites for melee combat. Thrilling, but not particularly vampiric. Instead of sneaking and charming your way through dungeons, you can plow through them in half the time. It’s a fittingly Nordic take on vampirism, but a take that doesn’t hold up well under repeated play. Dawnguard offers more than this, though: skill trees for both the werewolf and the Vampire Lord, filled by killing enemies; flashy new armor and other knickknacks; additional quests not directly linked to the main plot’s conflict; the head-smacking final inclusion of arrow and dragon bone weapon crafting. But, ultimately, the Volkihar vampire faction and the Dawnguard faction constitute the bulk of the DLC. And for the most part, that bulk is just more Skyrim. But what kind of “more,” exactly? Certainly not the sort of small moments that so often define one’s time in the land of the Nords, the random wilderness encounters and Jack London-esque struggles that mean so much because they’re divested from any authored story other than the player’s own. If I were to make a list of the things Skyrim, under no circumstances, does well, “set-piece battles” and “engaging high-fantasy storylines” would be at the top. And yet so much of this DLC rests on those two elements. Dawnguard also adds some impressively large—but isolated—areas to compete with the vanilla game’s huge underground Falmer bastion, Blackreach, and with the massive breadth of Skyrim proper. The Soul Cairn (purgatory for souls used in necromantic rituals) and the Forgotten Vale ruins are visually impressive, but so large and empty that they’re lifeless (ugh) and a chore to traverse—too big for their own good. But then again, Skyrim: Dawnguard is very much an exercise in excess, design of the “more” philosophy. It’s undoubtedly an improvement on the base title, but the sort of improvement that comes from throwing so much out that something in the bloody glut of content is bound to work. Is this the way to expand on the already expansive? Perhaps. But, as Serena said to my Dawnguard-aligned Wood Elf after I refused her offer to turn me bloodsucker, “Not your first choice, I guess?” Nope. And not my second, either. Sean Clancy is a freelance writer in the Boston area. He’s a frequent contributor to DigBoston and gets all kinds of silly on Twitter.